After spotting this CD secretly stashed in my friend's collection last night, I have decided to honor this prototypical New Wave one hit wonder single. With the British taking American black soul styles and churning them back out for numerous New Wave hits (i.e. Paul Young, Spandau Ballet, Duran Duran, Phil Collins, etc. ), Hipsway snuck in there at the end of the era for this dark white funk hit. 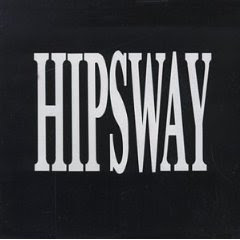 As a matter of fact, Hipsway remind me of Duran Duran for their clipped lyrics and sustained, snakey lead vocals. Besides all the catchiness and danceability in a mere 3 minutes and 15 seconds, the song's aura definitely comes from Grahame Skinner's deep menacing baritone lead vocals. When you are oozing out a song about the not-very-subtle "honeythief" of the title, that kind of tone is enough to excite all the girls who were listening in! They sure knew had to make great singles in those days. The whooshing organ that comes out of nowhere for the middle break, the black background singers on the chorus, and that funky guitar line that rips off Spandau Ballet's "Chant No. 1." But Hipsway was more than that one single. Like my friend, I also have that debut album which contained terrific singles that made it far bigger in the UK than the US, like "Broken Years" and the even more menacing "Ask The Lord." In the official video, there's some vaguely weird about the African native clips cut in with the band performing and Skinner's strutting around. I am still slightly embarrased to be outed as a Hipsway fan, you cant accuse me of buying their music for their looks, thats for sure, or their fashion sense either, so that had to leave something notable and about all that is left is the music. I was always happy listening to them because I felt they delivered a less pop version of Level 42. When I first heard them in either March or April of 1987, it was on MTV as a "Hip Clip". The song styling is definitely R&B with a funky tone mixed in with Jim Kerr's voice from Simple Minds a la "Sanctify Yourself". I bought the LP at my local records store back then. It is still in what is left of my vinyl collection. I had the opportunity to buy the US remix release of "The Honeythief" but chose to forego it being a college student with not much money. It is one of the few songs and albums out there I still play from time-to-time.